As a children's magician Andy strives to make his magic shows as fun and magical as possible. His magic shows will have the kids rolling around with laughter and left and left in bewilderment as he makes the magic happen. Its a fun-packed magic show with the magic woven into great stories that will catch the imagination of children of all ages. 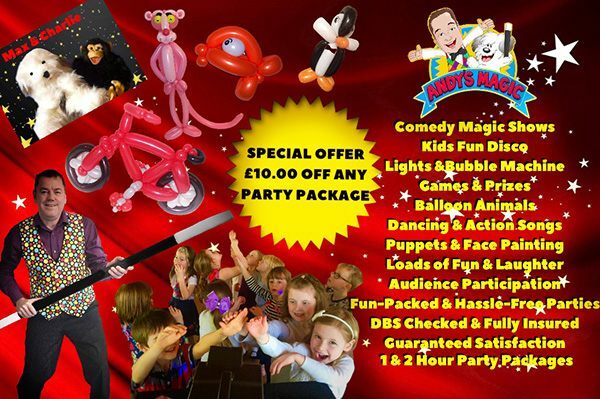 One of Dudley's leading children's entertainer and magicians Andy is ideal for birthday and Christmas parties, weddings, christening, Schools and Day Nurseries. Charlie and Max in the Magic Show. Don't forget in invite Andy's crazy but adorable puppets, Charlie the Monkey & Max the Magic Dog who make thier appearance during the party and cause absolute mayhem, and finally end up producing sweets for all the children at the party. All children / kids love these puppets and guarantee and laughter-filled apperance. "Andy captivated the audience from start to fiish. Two hours of fantastic children's entertainment. My son loved the magic show and especially the appearance from Max the Magic Dog. Andy you were brilliant." ~ Emma Carttwright, Sedgley, Dudley.